We are among the renowned organization that manufacture, import, export and provide service of a wide range of Products For Nano Technology also. These are manufactured and developed using top grade components that are quality tested to deliver a flawless range to the clients to meet the demanding requirement of the clients. We are providing our products around every part of the world at economical prices. 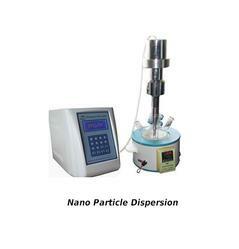 We are a Nano Particle Dispersion manufacturer in India. Probe sonication is highly effective for processing nanomaterials (carbon nanotubes, graphene, inks, metal oxides, etc.). The Sonicators are the most effective units for nanoparticle applications. These models can be used with a variety of powerful probe options which can process samples quickly and effectively. The key detail to discuss when considering a Sonicator is the sample volume range. The sample volume indicates which size probe is required. When used with a standard probe, these are routinely used to process samples up to 1.5 liters. This can process up to 40 liters. Flocells are inline processing accessories which can be used to process up to 20 L/min. Flocells are available for each of these 3 Sonicator models. Solid tip probes are required when organic solvents are used with the nanoparticles. Aqueous samples can be used with replaceable tip probes. Most nanomaterials require extended processing times and high amplitude settings so microtip probes are generally not recommended. Due to this, the use of microtips, as well as smaller Sonicator systems, is only recommended on a case-by-case basis. When working with volumes under 1 ml or very expensive samples, a Cup Horn (indirect sonication method) can be considered. Cup Horns prevent aerosolization and cross contamination and may be beneficial to certain sample types. Dispersions in vials (a) have coagulated CNTs in the body and at the bottom by means of bath sonication for 8 hrs, (b) appear free-homogenous with probe sonication for 3 minutes, and (c) keep free-homogenous even after 4 months of sitting at room temperature. The concentration of MWCNTs is 2500 mg/L and the MWCNTs/SDS ration is 1:10. (d) MWCNTs of (c) was diluted to 25 mg/L with deionized water. It is clear that MWCNTs are not completely soluble in water by using bath Sonicator for 8 hrs; there was much sedimentation of MWCNTs at the bottom of a small bottle. Upon operating 20 kHz applied by a probe Sonicator, the MWCNTs are entirely dispersive in aqueous solution, forming a homogeneous-free solution. Remarkably, there is no sedimentation observed even after four months of sitting at room temperature.